There are more than 150 million blogs, according to Technorati’s “State of the Blogosphere” report. Given competition of that magnitude, why should people spend time reading yours? As a frequent blog consultant, I find the success impediment isn’t really the effort required, but rather a planning deficit. Most blogs fail not due to quality, but due to randomness. Whether your blog is brand new or you want to take your experienced blog to the next level, the key is to not leave whether or not success happens to the vagaries of chance. 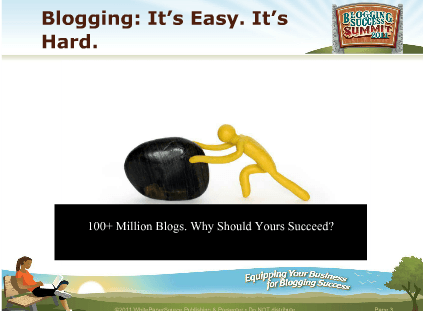 That was the theme of my recent Webinar at Blogging Success Summit 2011. What is this blog going to do for you, or for your business? Are you trying to boost awareness? Are you trying to sell something, utilizing the blog as the top of your purchase funnel? Are you trying to build community and kinship around your company? All of these are valid reasons for having a blog, but they are significantly different in terms of how your blog is designed, written, measured, and judged. Pick an objective, and focus upon it with intensity. How is your blog enriching the lives of your readers? Is it directing them to resources? Answering questions? Provoking debate? And who are your readers anyway? What are their likes, desires, fears, and expectations? What other blogs do they read? The more you know about your audience, the better you can serve it. What’s your call-to-action? Depending upon how the blog fits your strategic business objectives, you may prefer your readers to download longer form content (like an e-book), or subscribe to your blog, or leave a comment, or tweet your post. Decide what behaviors you’re ultimately trying to entice, and design and write with those action objectives in mind. Certainly, you should optimize your blog for search, as Google is truly your most important reader. But beyond that, how will people know about your blog? Create a blog marketing plan and revise it when necessary. Make sure you do the basics like promoting your blog on your website’s home page (don’t play navigation scavenger hunt with your blog), and promote your best blog posts in your email newsletter. It takes a village to raise a blog. You need content creators, naturally. But you also need (if you have multiple authors) a strong editor who can achieve consistency in tonality and layout while managing the editorial calendar. Optimally, you should also have a person dedicated to blog success metrics, using data analysis to tweak and improve your efforts. In terms of content creation, more is more. Five posts per week is better than four, which is better than three. And if you can’t blog at least weekly, you need to seriously consider if you’re able to devote requisite energy to this endeavor. 2. Always have a list of potential topics at-hand. For new blogs, I recommend writing 50 sample headlines before you write one post. This will help you better understand what your blog and editorial voice are REALLY all about. 3. Don’t overwrite. This post notwithstanding, shorter is better, and spending a bunch of extra time to create the “perfect” blog post is almost never worth it. 4. Be a great headline writer. It’s all a potential reader has to go on to decide whether to click and read (usually). Blogging is just one part of the content marketing ecosystem. If you’re not taking your ideas and atomizing them, cross-pollinating your thinking like a digital dandelion across the Web, you’re working way, way too hard. Your blog posts can become e-books, Slideshare presentations, podcasts, free downloadable worksheets, email newsletter content, Facebook status updates, and dozens of other potential bits of content flotsam. The success metrics you use are based on the core business objectives you selected for your blog at the outset. If you’re blogging for awareness, traffic is important (especially new visitors). If you’re blogging for sales, the success of your blog in getting people over to your “main” website, or downloading your price list becomes a key consideration. And if you’re blogging for kinship and community, comments and sharing are critical barometers. Far too often corporate marketers ask me how then can increase the number of comments on their blog. The problem isn’t too few comments, but rather thinking that for a blog devoted to sales (or awareness), that comments is a valid success metric. If you can work with your company to answer these 8 questions, I absolutely guarantee you will improve the chances of your blog being a smash hit. What other questions should I have recommended in this presentation? Thanks for your help thinking it through.